Share the post "Turmeric Tea Health Benefits And Easy Recipes"
Aside from the warm and spicy taste, turmeric is considered one of the best spices in the world for all round health benefits. It is an excellent anti-inflammatory and a powerful liver cleansing spice, which can help to detox your liver. It is also recommended for treating gastrointestinal problems, relieve joint pain. Studies have shown that turmeric is more effective at easing pain than aspirin and other similar chemical medications. It is a great help in the relieving of chronic arthritis and joint pain, as well as relieve symptoms of ulcerative colitis and osteoarthritis, which are two other inflammatory conditions. One of the active ingredients in turmeric is called curcumin, and is used in traditional Chinese medicine and Indian Ayurvedic medicine to treat arthritis. It is claimed that turmeric reduces arthritis joint pain, inflammation, and stiffness related to arthritis. Some studies show the spice might improve brain function (Your can read about top foods for the brain here). 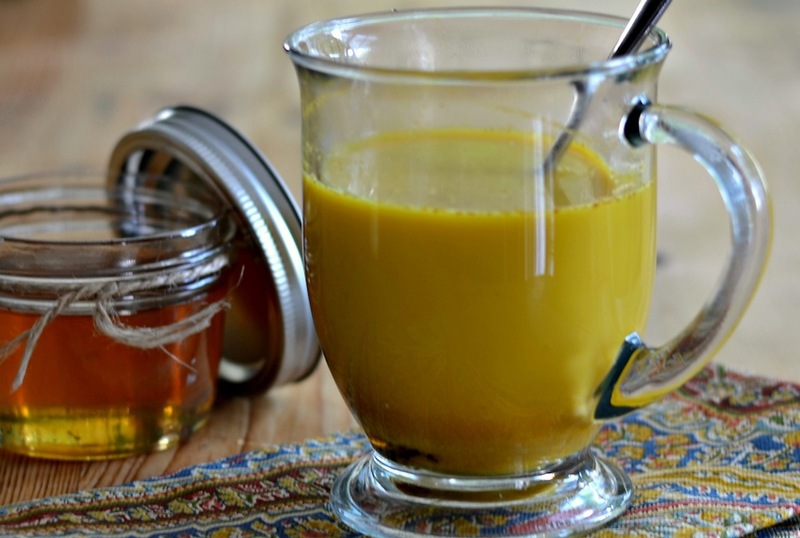 A great way to incorporate turmeric in your diet is by making a tasty turmeric tea. You can even substitute your morning coffee with it. It’s slightly sweet, slightly spicy and extremely delicious. It tastes very similar to a chai tea. Turmeric tea is very easy to make and chances are that you have all the ingredients in your kitchen. – Fresh ginger – turmeric combined with ginger doubles the anti-inflammatory results. Ginger also works wonders for headaches, joint pain, and arthritis, especially rheumatoid arthritis. Ginger is a very effective digestive aid. – Black pepper – sources agree that piperine in black pepper maximizes the benefits of turmeric and helps our body absorb it better. – Cinnamon – cinnamon contains anti-inflammatory properties. – Coconut milk – the fats in the coconut milk help enhance turmeric nutrient absorption. These medium chain fatty acids also get used immediately as energy for your body and aren’t easily stored as fat. These extremely healthy and beneficial fats also keep you full longer and actually protect against heart disease and cardiovascular disease. – Raw honey – raw honey is rich in enzymes, vitamins, nutrients and antioxidants and helps promote digestive health. It is not recommended to use ground turmeric and ground ginger for this tea because the taste will be different, but anyway it is possible. Fresh turmeric and fresh ginger have exceptional flavor and tastes much better than their ground counterparts. Blend all ingredients in a high speed blender until smooth. Pour into a small sauce pan and heat for 3-5 minutes over medium heat until hot but not boiling. Drink right away. It is relaxing before bed too. Cut the ginger into 3 or 4 small slices, add about 3/4 of a teaspoon of the tumeric and 1 tablespoon of honey. Put this in a glass and pour in about 2 cups of water. You might want to strain it. For 1 cup of water use 1 teaspoon each of fresh grated turmeric and ginger roots. If you use ground turmeric and ginger, use 1/3 teaspoon each. Add raw honey to taste, and a slice of lemon if you want. In order to increase turmeric absorption in the body (studies have revealed that turmeric has low absorption and rapid metabolism that lead to relatively low bioavailability in the body) you need to add a little bit of fat to the tea, such as a teaspoon of coconut oil or flaxseed oil for example. Another option is to add a little bit (1/4-1/2 tsp) of black pepper that contains piperine which aids the absorption of curcumin. In a small saucepan, bring water to boil. Add fresh grated turmeric and ginger, reduce heat, and simmer for 10-15 minutes. If using ground turmeric and ginger, boil for 7 minutes. Then strain the tea and add the honey and lemon to taste. Add the coconut oil or black pepper. You can also make a turmeric paste. With a spoon, mix the turmeric and honey together in a glass jar. For immediate enjoyment, stir a spoonful in one cup of boiling water. The rest will keep in a cool, dark place like your cupboard. For a sweeter taste, either add less turmeric or more honey. For an extra kick, add grated ginger, a squeeze of lemon, and/or cracks of black pepper. There are no official dosing instructions exist for turmeric tea, but it’s better not to overdose it. We think one cup a day will be enough. Clinical studies have not been conducted on the health benefits of turmeric. Turmeric tea drunk in excess could cause liver damage in those who are already prone to liver disease. It could also affect those with gallbladder disease, those who take blood thinner medications, drugs for diabetes or stomach acid-reducers. Drinking excessive turmeric tea can also cause circulatory problems. Pregnant women are advised to control consumption since it could stimulate the uterus.